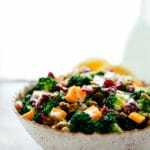 A delicious, simple, and quick lemon poppyseed broccoli salad. 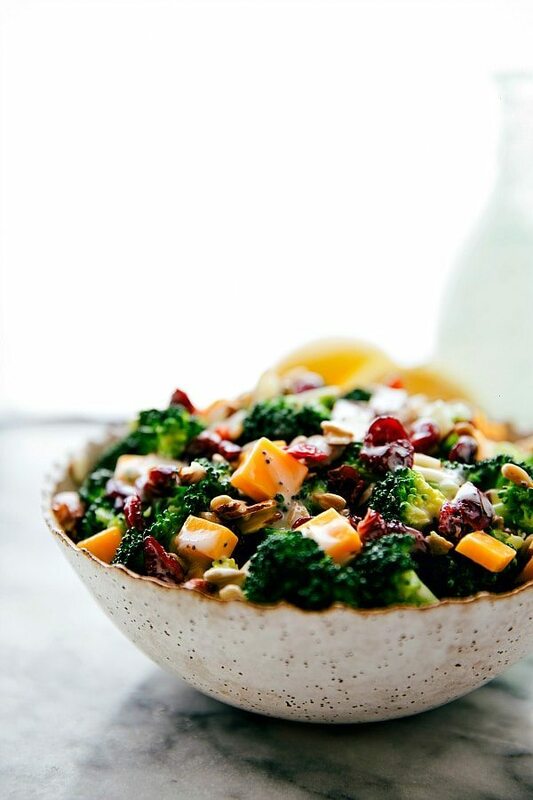 Broccoli, dried cranberries, sunflower seeds, sharp cheddar cheese, and sliced almonds with a delicious creamy lemon poppyseed dressing. This salad has accompanied dinner every single night this week. It’s THAT good. Coupled with the fact that I bought enough broccoli to feed a small army. You know, when it goes on sale, you gotta stock up right?! Each night I’ve made slight adjustments and am so excited about the salad! It’s has quickly become a favorite in my home. It’s not quite summer yet (okay we’re in the throes of a FREEZING winter ? ), but I’m telling you now, you are going to want this recipe come summer potluck and BBQ time! It’s perfect for any dinner party that you need to bring a crowd-pleasing salad too, but summer this recipe may just become your go-to salad! It comes together super quick and isn’t too revolutionarily different from the many broccoli salads that float around the inter-webs. It was inspired by a pretty similar salad we just had at an open-house/party/function (???) this past Sunday. The broccoli salad that whoever brought (I never actually found out WHO made it!) to the party was a huge hit! It had the traditional sweet mayo dressing and was loaded with red onions, bacon, raisins, cheese, and of course lots of BROCCOLI. Since the hubs is not a fan of onions at all, and I’m not a fan of regular raisins in any salad, I added some extra nuts (almonds), threw in some sunflower seeds, and used dried cranberries. ? And of course, the cheese. Just little cubes of delicious sharp cheddar! 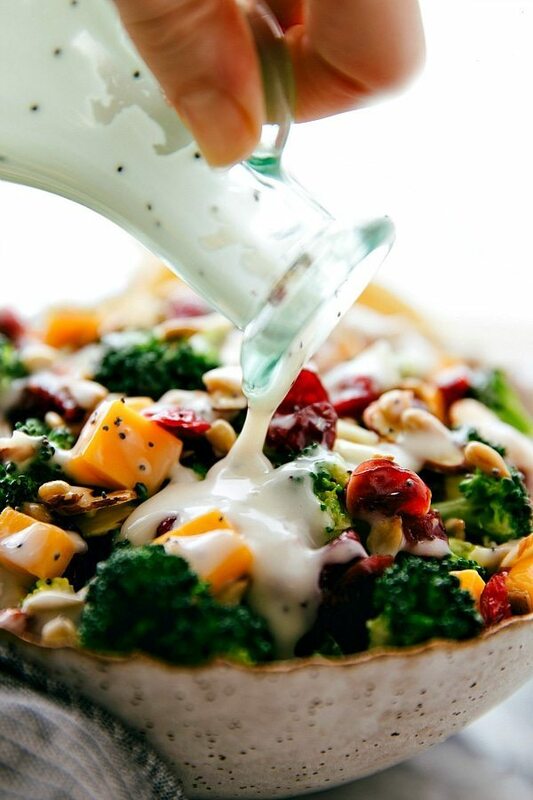 The dressing is also pretty close to your traditional broccoli salad — mayo, vinegar, and some sugar. I decided to put a little bit of freshness by adding the lemon. It is not overpoweringly lemon at all. In fact, it’s barely a hint of lemon with only 1 tablespoon in the whole dressing. That’s the most I could add without it getting too watery. To enhance that lemon just a bit more, I added some finely grated zest. I also played around with the vinegars added and red wine vinegar was the winner! It’s delicious with the lemon and mayo. And finally, the sugar. You can definitely increase or decrease the sugar based on personal preference. From a google search I saw some salads call for an entire 1/2 cup ?. 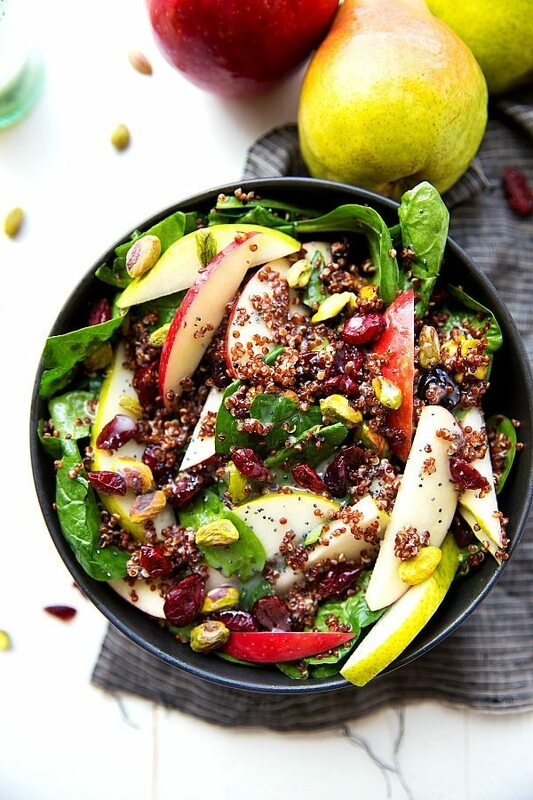 This dressing only calls for 2 tablespoons, so if you want a super sweet salad, increase it from there! And if you want the dressing to really stick to the salad, make sure to use full-fat mayo. That and, make sure the broccoli is WELL dried. Otherwise it makes the whole salad kind of blahh. And finally, the last thing I found that brought this salad from wow to WOW, was a quick blanch of the broccoli. First off, make sure the broccoli is cut into really small pieces. This makes the salad taste better as you (1) get a little bit of everything in each bite (instead of a huge “broccoli bite”) and (2) the dressing is able to adhere better to the broccoli. Next, boil a pot of water with about 1 tablespoon of salt. As soon as the water is boiling, pour in the small pieces of broccoli. Immediately start counting to 30 and as soon as you get to thirty, remove the broccoli, and drain it. Pour the broccoli into a prepared ice bath. (I just fill up a bowl with cold water and a few cupfuls of ice. Allow the broccoli to sit in the ice water until completely cooled off and then remove with a slotted spoon. If you have a salad spinner, you can put the broccoli in there to dry. Otherwise, squeeze the excess water with a napkin or paper towel until the broccoli is 100% dry. Remove the stems from the broccoli and cut into very small pieces. IF you want to blanch the broccoli follow the next few steps. If you're short on time or don't mind raw broccoli you can skip blanching. Fill up a bowl with very cold water and a few cupfuls of ice. Bring a pot of water to boiling point. Add in a heaping tablespoon of salt. Pour the broccoli into the boiling water and count to 30. As soon as you get to 30 drain the broccoli and pour the broccoli into your prepared ice/water bath. Allow the broccoli to sit in the cold water until completely cooled. Then remove with a slotted spoon to a salad spinner or bowl. Make sure the broccoli is 100% dried before tossing it with anything else (especially the dressing). I like to use a salad spinner and then let it sit out for a while. If it's any bit wet, it becomes too watery. 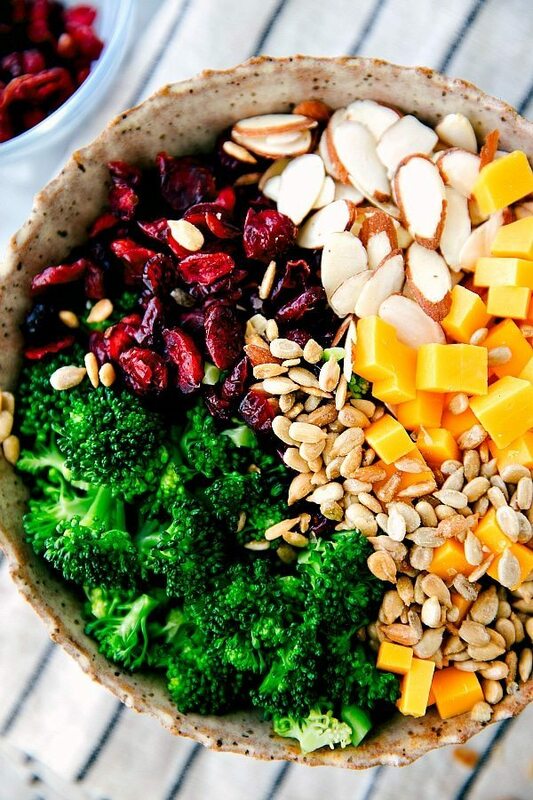 Add the cranberries, almonds (toast if desired), sunflower seeds, and sharp cheddar cheese (that has been cut into very small cubes) to the bowl with the broccoli. In a bowl, whisk together the mayo, red wine vinegar, sugar, zest of one lemon, and about 1 tablespoon lemon juice. Toss the dressing with the salad and place in the fridge to marinate for 15-30 minutes. Oh goodness, it’s been freezing here too but that never stops me from enjoying a good salad! This one is gorgeous, Chelsea! 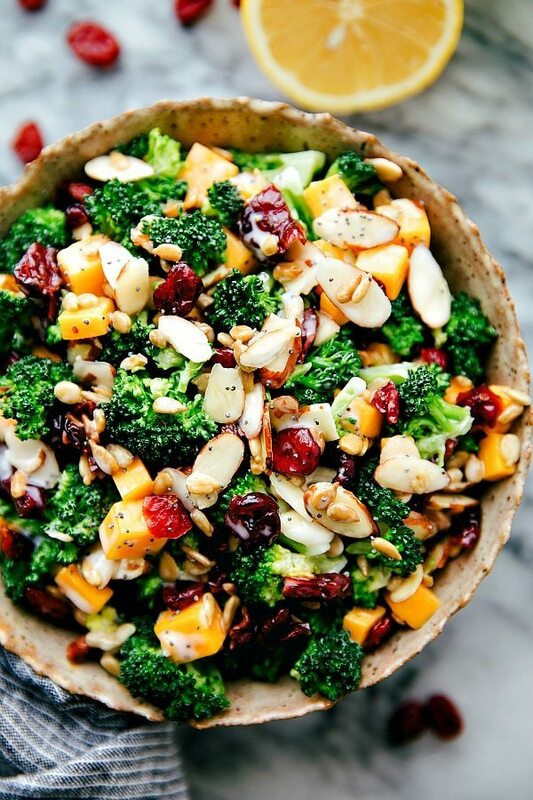 I love the broccoli and cranberry combo! 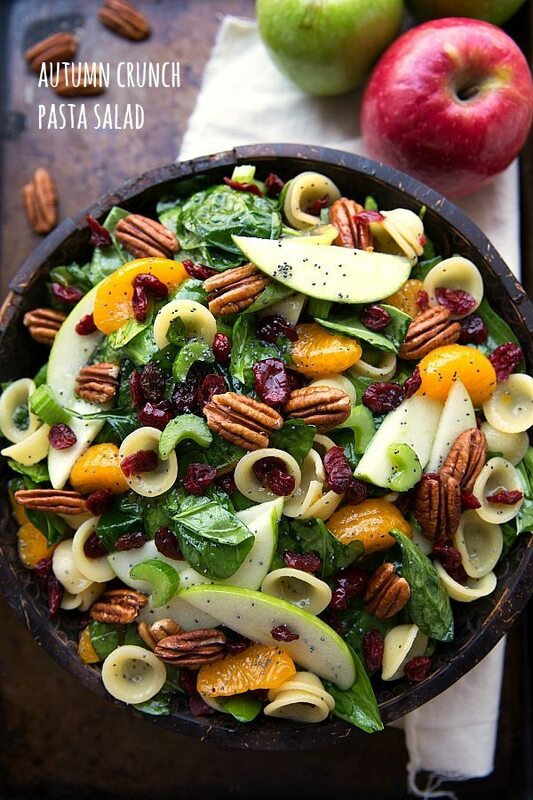 Love, love, love this gorgeous salad!! Love the cranberries and the poppyseed 🙂 Pinning! Your tips for making this salad are so useful. I never get my salad quite dry enough, and wonder what went wrong. This salad is so gorgeous!! I tried this with pignoli’s and jack cheese which I already had in my refrigerator and it worked great. Ooooooo I need this. Everybody needs this. Haha yes!! 😉 Thank you Lindsay! What a beautiful salad! 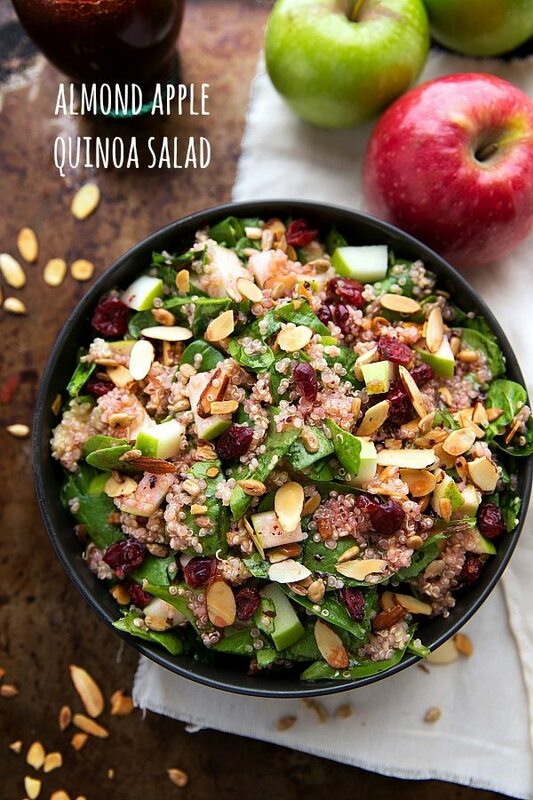 I love adding dried cranberries to my salad and love the combo going on here! Wow this broccoli salad looks AMAZING!!! I love the colours and the flavours sound so delicious! I could totally eat that whole bowl right now!! That salad looks like Spring! And I’m sure ready for Spring…this will be on my menu this week, for sure. Thank you. P.S. I’m giving it 5 stars even though I have tasted it, yet. I just know it will be worthy. Can this be made the night before?? I’m hoping so, maybe I’ll chop everything and add the dressing in the morning. Made this last night and my grand daughter that HATES broccoli LOVED it! So DELICIOUS! What a huge win!!! 🙂 I’m so, so happy to hear that! Thank you Vesta! So glad to hear that!! 🙂 Thank you for the comment! I am definitely going to try this for my kids, very soon, this looks so yummy and so beautiful! Can’t wait to try this salad! Two questions: what kind of onion did you omit and with the dressing already mixed how many days will it keep? I just made this salad for a Father’s Day BBQ. I have to say, I have made a lot of variations of Broccoli Salad and this was by far the best. The lemon gives it such a refreshing flavor! The only change I made was adding about 10 strips of crumbled crispy bacon… because BACON! 😀 Thanks for such a great recipe! Oh, this makes my day!! I’m so thrilled to hear this one was the best! 🙂 And YUM on the bacon addition! Thanks Diane! I absolutely despise mayonnaise, so instead I used plain yogurt for the dressing. Huge hit at my work potluck. I always consider it a successful dish when I don’t get to bring any home! That’s great!! And so happy that there wasn’t any to bring home 🙂 Thanks for the comment Nicholas! Made this last night for a small family get together, everyone loved it! My husband had thirds! And two people wanted the recipe. Also I was asked to bring it to our big family bbq next month. This recipe is definitely a keeper! Thanks! I made this today and it’s totally a pin(terest) win! I made a couple small tweaks…I added 1/2 tsp lemon extract and toasted the almonds. Loved it! !